Discovered 1764 by Charles Messier. 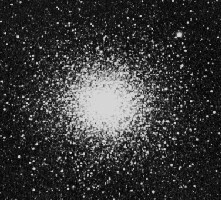 Messier 3 (M3, NGC 5272) is one of the most outstanding globular clusters, containing an estimated half million stars. It is famous for the large number of variable stars discovered in it. This cluster was the first 'original' discovery by Charles Messier when he logged it on May 3rd, 1764. At that time it was the 75th deep sky object ever observed by human eyes (and apparatus), although at that time, it was only the 54th known nebulous object, while 21 objects had been forgotten again, according to the sources and current knowledge of the present author (see the Deep Sky Object Discovery Table). Perhaps the discovery of this object eventually caused Charles Messier to start a systematical search for these comet resembling objects, and not just catalog chance findings as in the previous cases, M1 and M2. Alternatively, Messier may have started this endeavor due to other reasons, and it was just his first discovery - anyway, the search which started with M3 lead him to catalog the objects up to M40 during this year 1764. When the final object of the catalog, M107, a globular cluster in Ophiuchus, was discovered by Messier's friend Pierre Méchain 18 years later, in 1782, a total of at least 154 objects had been observed and at least 142 were known, more than double the number, and 110 of them described by Messier (who discovered 44 or 45) and Méchain (25 or 26) -- the doubty counting being a result of the dubious circumstances concerning the discovery of M102. M3 was first resolved into stars and recognized as cluster by William Herschel around 1784. At a distance of about 33,900 light years, M3 is further away than the center of our Galaxy, the Milky Way, but still shines at magnitude 6.2, as its absolute magnitude is about -8.93, corresponding to a luminosity of about 300,000 times that of our sun. M3 is thus visible to the naked eye under very good conditions - and a superb object with the slightest optical aid. Its apparent diameter of 18.0 arc minutes corresponds to a linear extension of about 180 light years; Kenneth Glyn Jones mentions an estimate of even 20 arc minutes from deep photographic plates, corresponding to about 200 light years linear diameter. It appears somewhat smaller in amateur instruments, perhaps about 10 minutes of arc. But its tidal radius, beyond which member stars would be torn away by the tidal gravitational force of the Milky Way Galaxy, is even larger: About 38.19 minutes of arc. Thus, this cluster gravitationally dominates a shperical volume 760 light years in diameter. On the other hand, M3 has a compressed, dense core measuring 1.1' in diameter, or linearly, 11 light years, comparatively large for a globular. Its half-mass radius is 1.12', or about 11.2 light years, so that half of this clusters mass is contained in a volume of only 22 light years in diameter. The cluster's brightest stars are of mag 12.7, while the so-called Horizontal Branch giants are of mag 15.7, and the 25 brightest stars have an average brightness of 14.23 mag. The age of globular cluster M3 has been estimated from its color-magnitude diagram on various occasions; historically, early values have been given at 5 billion years (Baade), 11.4 billion years (Woolf), 20 billion years (Arp) and 26 billion years (Sandage). Sandage (1954) counted 44,500 stars brighter than mag 22.5 within a radius of 8 arc min; the total mass has been estimated at 245,000 solar masses (Sandage and Johnson). Helen Sawyer Hogg has given M3's overall spectral type as F2, and a color index -0.05, rather blue for a globular, while the Sky Catalogue 2000.0 gives its spectral type at F7, and W.E. Harris lists it as F6. Its color index was determined as B-V=0.69. This stellar swarm is approaching us at 147.6 km/sec. Situated in the Galactic halo, out about 40,000 light-years from the Galactic Center, M3 is moving on a box-type orbit of approximate excentricity 0.55, which takes it out up to 66,000 light-years apogalactic distance and up to 49,000 light-years above and below the Galactic plane (currently it is about 33,000 light-years above - i.e., north of - that plane). On the other hand, its perigalactic distance is only 22,000 light-years - at that distance, the tidal radius of M3 will go down to below 200 light-years, so that the outermost stars may easily escape from this globular cluster. 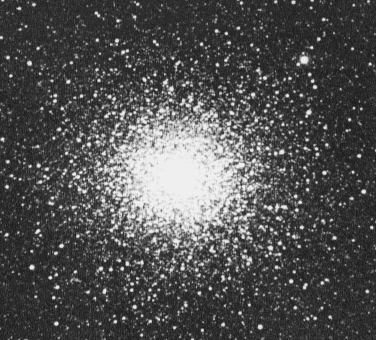 Globular cluster M3 is extremely rich in variable stars: According to B. Madore (in Hanes/Madore, Globular Clusters, 1978), 212 variables have been found, 186 periods determined, more than in every other globular cluster in our Milky Way galaxy (and thus the most ever observed); at least 170 RR Lyrae variables (sometimes called "cluster variables") were discovered. These stars have served as "standard candles" to determine the cluster's distance. The first variable star was discovered by E.C. Pickering in 1889, the next 87 were found by S.I. Bailey in 1895 (see Pickering and Bailey 1895), and to 1913, 138 by Bailey. Christine Clement (2009) lists 268 variables, 11 suspects and 24 formerly designated non-variables, most of them (253) RR Lyra's. M3 contains a relatively large number of so-called Blue Stragglers, blue main-sequence stars which appear to be rather young, much younger than the rest of the globular's stellar population would suggest. These were first discovered by Alan Sandage (1953) on photographic plates taken with the 200-inch Hale telescope on Mt. Palomar. A mystery for a long time, these stars are now thought to have undergone dramatic changes in stellar interactions, getting their cooler outer layers stripped away in close encounters, which occasionally occur when stars are passing through the dense central regions of globular clusters. Christine Clement, 2009. Variable stars in NGC 5272 / C1339+286 / Messier 3. Updated 2009. http://www.astro.utoronto.ca/~cclement/cat/C1339p286. 268 variables + 24 former suspects + 11 unconfirmed suspects: No. 1-274, 286-298 with double entries for 3. 177 RR Lyrae type RR0, 51 type RR1, 10 intermediate RR01, 5 unspecified RR Lyras; 1 Cepheid variable of type W Virginis; 8 semi-regular variables; 9 SX Phoenicis stars, 3 eclipsing binaries (1 EB, 2 EC); 4 untypized.